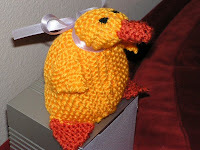 A few weeks ago I attempted to make Lion Brand Yarn's Pocket Pet Duckling. In the end, I didn't like the Fun Fur, didn't like the fact it was a duck without wings, and really really disliked the look of using felt to make the beak and feet... wishing instead that it was truly a fully knitted duck. My solution to a better knitted duck plush? Make my own! I use the same concept of knitting a square that is folded in half to make a triangle for the duck's body as inspiration, but that's where the similarities end. This duck sports fully knitted wings, feet and beak, and sits up on its own instead of laying down. Here's the pattern! If you can cast on, use the plain knit stitch (garter stitch), can knit 2 together (K2T) and bind off, you're set! Here we go. You now have a square. Fold it in half so that you form a triangle. 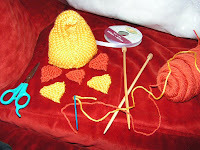 Using your lengthy tail and a tapestry needle, stitch up one side of the triangle. Open it up and you'll see that you now have a cone. You may wish to flip it inside out so that your seam looks neater. Stuff the cone, keeping in mind that the pointed end is going to end up being the head, and the seam goes up the stomach of your duck. At the top of the cone, you'll have an extra "flap" that you now fold over like a triangle. Sew the edges closed, and you've formed the rear end that the duck will sit on. Shape it to "sit" up on its rear like in the photo. Now it's time to make the other body parts. Weave in ends. Stitch wings and feet to duck in appropriate places. I positioned the wings so that they were like hands -- sewing them on their side so that the pointiest end where I bound off was facing the stomach. I used the bottom seam as a guide and lined up each foot along that seam when I stitched it on. Weave in ends. Stitch beak to duck at the end of the face, making sure the pointy end where you bound off is hanging a bit over the edge of the face. Once you've stitched the back of the beak onto the face, fold the pointy end under the "chin" and stitch down, making a more blunt beak. Tie a ribbon around the duck to clearly define the neck area. You can make eyes either by sewing on black seed beads or embroidering the eyes with black yarn. Voila! Enjoy the pattern, and if you make any ducks, I'd love to see them! Send them my way to knit.sew.paint.purl at gmail.com and I'll showcase them here :) Remember that the pattern is protected under the Attribution-NonCommercial-NoDerivs 2.5 Creative Commons license, and anything made from it may not be used for commercial purposes. You may not make anything from the pattern and sell it or resell/redistribute the pattern in part or in whole. I would like to know if I can make and then donate the ducks to EPU. 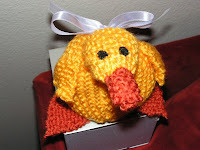 I am really big on knitting for disabled kids and was looking for more animals to give them. Yes of course! Thank you for asking -- I love knowing that the pattern will be used for something so wonderful and donated to kids who will enjoy them. Take care!